An explosive “Spanish Plume” severe weather setup is shaping up for the UK on Wednesday, as the ongoing heat wave gives way to a trough and cold front from the Atlantic. An unusually explosive environment for thunderstorms appears increasingly likely for parts of the UK on Wednesday. The environment ahead of the front will be very unstable, with models indicating high instability with up to 2000-4000 J/kg MLCAPE and as temperatures reach 26-30 °C, locally more, and dewpoints in 19-22 °C range. Certainly quite uncommon values for this area. A 40-50 kt southwesterly mid-level jet overspreads the region, with backing surface southerlies and southeasterlies. While it is still too far ahead to talk about any details, any thunderstorms that may form in this environment will pose a threat for large and even very large hail (>5 cm), heavy rainfall and severe straight line winds. Tornado threat will also be enhanced. 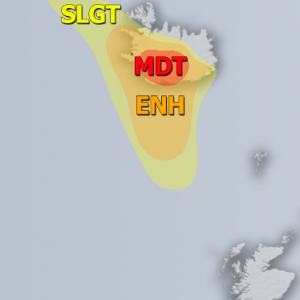 The exact zone where severe thunderstorms may occur, their coverage and intensity depends on the position of the trough / jet aloft, but in general the northern and eastern parts of UK are likely to see thunderstorms. We will be providing additional updates on this setup tomorrow.